I have been following the upheaval in Libya and came across a press release from UNESCO pleading for the protections of Libya’s archaeological sites. As the statement reads: “Experience shows that there is a serious danger of destruction during times of social upheaval. It has taught us to look out for looting by unscrupulous individuals, that often damages the integrity of artifacts and of archaeological sites. Careless dealers who buy these objects and fragments are in fact inciting more looting. It is therefore crucial that the international antiquities market be particularly wary of objects from Libya in the present circumstances,” Irina Bokova [Director-General of UNESCO] cautioned. I am reminded of the looting in Iraq following the 2003 US intervention but also of citizens protecting the Egyptian Museum in Cairo last February amid the riots. Libya has 5 designated UNESCO World Heritage Sites spanning Prehistoric, Phoenician, Greek and Roman periods. I have even seen tours advertised (well, not anymore) to Libya to view these magnificent works of art. 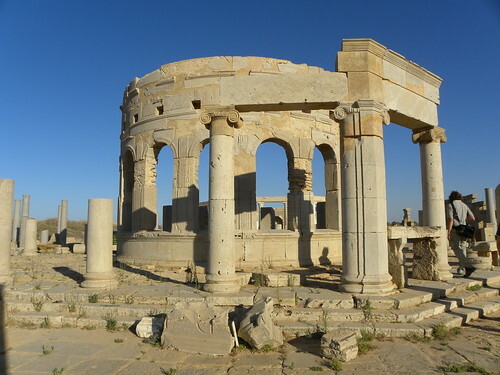 My thoughts are certainly with the Libyan people who I hope have peace and stability soon, but it would be a tragedy if violence and lawlessness destroys their cultural heritage.